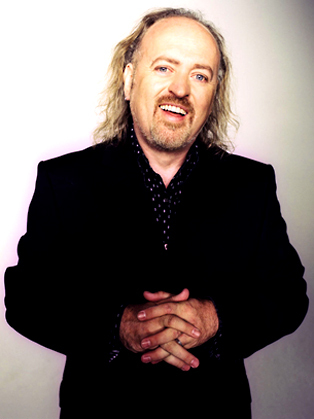 Aside from his talent as an entertainer, for which he received a British Comedy Award for Best Live Stand-up, Bill Bailey has also made his mark as an actor. He starred in the Channel 4 sitcoms Black Books and Spaced, and in the feature films Nanny McPhee and the Big Bang, Burke and Hare and Hot Fuzz. Bill is best known as a former team captain on Never Mind the Buzzcocks. Other TV credits include Monster Night, Is It Bill Bailey?, The Stand Up Show and Space Cadets, as well as numerous spots on Have I Got News For You. He regularly pops up on QI and radio panel shows, and presented the nature programme Wild Thing I Love You. Bill Bailey is a comedian, musician and actor most well known for live shows Dandelion Mind, Tinselworm, Bewilderness and Part Troll, and his work on television in programmes such as Never Mind the Buzzcocksand Black Books. After the Rubber Bishops, Bill teamed up with Sean Lock for 1994 Edinburgh shows Rock, before going solo in 1995 with Cosmic Jam and earning a Perrier nomination. This led to a 1996 TV broadcast of the show, featuring a souped up X-Wing-esque keyboard and a giant papier-mâché ant suspended from the ceiling. Among other things, Bewilderness demonstrated Bill’s wide range of musical knowledge, making him an ideal choice to take over from the late Sean Hughes as team captain on Never Mind the Buzzcocks in 2002. He remained in the captain’s chair on the show for 11 series before departing in 2008 to concentrate on developing other aspects of his career. Bill’s next big tour, Part Troll, was met with equal acclaim and achieved success all over the world. Its beginnings were at Edinburgh Fringe Festival 2003, a year when Bill also branched out as a dramatic actor in an extremely well received production of 12 Angry Men, as the restrained Juror 4. Two years later he assumed the vastly different role of the slouchy, unkempt Oscar in The Odd Couple, and received equally excellent reviews. Little Crackers series was transmitted in December 2010, marking the debut of a raft of new British-originated comedies for Sky 1 HD. Featuring Car park Babylon a 12 minute film written, co-directed by and starring Bill, in which his character temporarily forgets that Christmas is about giving, not gadgetry, the series also included films by Julia Davis, Stephen Fry, Catherine Tate, Meera Syal, Dawn French, the late Victoria Wood, Chris O’Dowd, Jo Brand, David Baddiel, Julian Barratt and Kathy Burke. In January 2011 Bill hosted Comic’s Choice for Channel Four – a five-episode celebration of comedy and comedic talent, which was broadcast nightly in the run-up to the British Comedy Awards. Each episode saw Bill chatting to a British A-list comedian (Alan Davies, Lee Mack, Jo Brand, Jessica Hynes, Sean Lock) about their favourite comedy performers, actors and shows. June saw Bill featured in the line up at The Bonnaroo Music and Arts Festival – a four-day, multi-stage camping festival held on a 700-acre farm in Tennessee every year. Bonnaroo brings together some of the best performers in rock and roll, along with dozens of artists in complementary styles such as jazz, Americana, hip-hop, electronica, and just about any contemporary music you can think of. Rolling Stone magazine named this revolutionary entertainment experience one of the 50 moments that changed the history of rock and roll, and it certainly geared Bill up for his next rock experience. In July 2011 Bill headlined the Saturn Stage at the Sonisphere Festival, Knebworth, sharing a line-up that included Slayer, Motorhead, Biffy Clyro and Metallica. Bill found himself faced with the daunting prospect of performing in front of a huge crowd of (quite possibly) rain-drenched metal-heads, there to see the likes of Slipknot, and, thinking there may be safety in numbers, he set about putting together a band. Bill was very fortunate to assemble a great bunch of musicians, especially as it turned out to be the biggest gig of his life to date with over 60,000 in the crowd. It was as a result of this that the album Bill Bailey In Metal was produced and released in November 2011 on CD and download. Despite its title, it is an album of many musical styles, designed to delight both metal and non-metal fans alike. Another rock point-to-note is that Bill also guested with Deep Purple at The Royal Albert Hall for a Sunflower Jam fundraiser, which was one of the Summer’s highlights for Bill. September saw him faring across the pond in New York, Boston, Chicago, and Toronto before gearing up for his next UK arena tour: Dandelion Mind (Gently Modified) in the Winter of 2011, making a pitstop to record the Doctor Who Christmas Special, The Doctor, the Widow and the Wardrobe. The seventh Dr Who Christmas special since the show’s revival in 2005 brings a very busy year to a close. With a smattering of QI episodes, a Hustle and an appearance in Jo Brand’s Big Splash in there for good measure, it’s goodbye 2011. In 2012 Bill started work on the creation of his new show, Qualmpeddler, taking it on a tour of the Highlands and Ireland in late Spring and on to Australia and New Zealand in the early Autumn. His Summer was spent filming with BBC Natural History Unit in Indonesia and Malaysia for Bill Bailey’s Jungle Hero, a two part documentary about naturalist Alfred Russel Wallace, who came up with the theory of evolution at the same time as Darwin, yet who seems to have been erased from history. Transmitted in April 2013 on BBC2, this was very much a passion project for Bill, whose interest in his hero was sparked some 13 years earlier whilst travelling in his favourite part of the world. The rest of 2013 has largely comprised of a UK Qualmpeddler tour, with the recording of Bill’s next stand-up DVD of the same name occurring sometime in amongst it. In October 2008, he performed Bill Bailey's Remarkable Guide to the Orchestra at the Royal Albert Hall with the BBC Concert Orchestra. In July 2011, Bailey performed at the Sonisphere Festival in Knebworth, headlining the Saturn Stage. He released an album, In Metal, using songs played at Sonisphere, later that year. In June 2014, The Music House for Children announced Bailey would become their patron alongside Sophie Ellis-Bextor in celebration of their 20th anniversary.